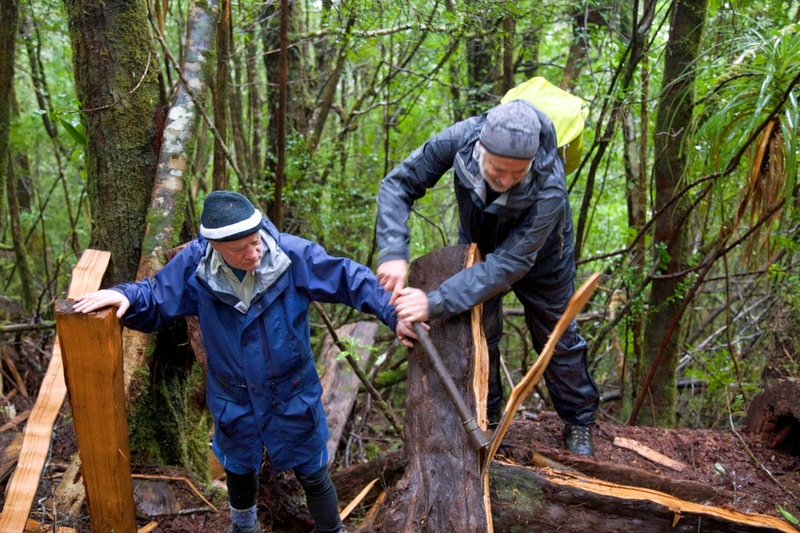 It’s like the shipping news for bushwalk huts. Always mornings in huts seem to commence with a comparative report on snoring levels. The men – this writer included – seemed to score at least reasonable decibel ratings during the night. But gender equity came into it, with at least one of the women also snoring to measurable levels. That formality dispensed with, Terry got us up and going by boiling a billy. He had what sounded like a packed program for the day – a couple of waterfalls, a few mines, a bit of off-track walking, and maybe a mountain – so he was keen to get us out there. Since it was all new to most of us, we were happy to be guided by Terry. The weather was typical west coast: cloudy, showery, with the odd patch of brighter sky. Regardless, even if the rain held off, we would need our rain jackets and overpants. 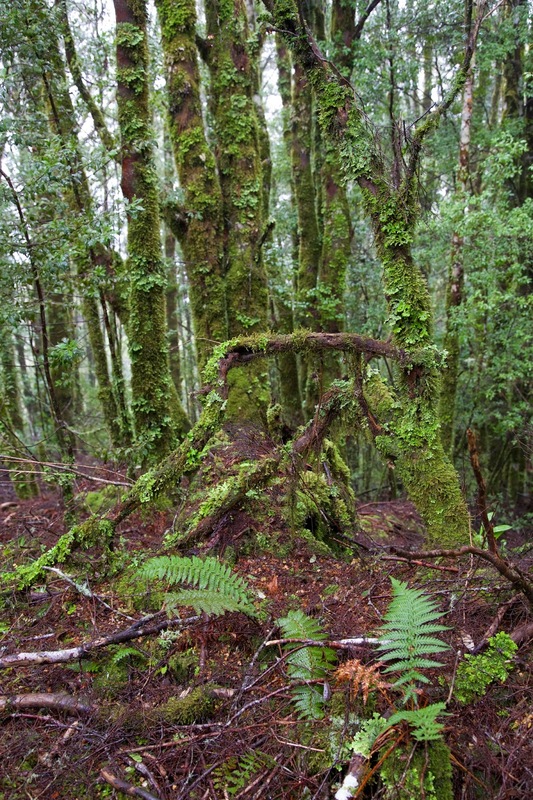 The rainforest’s dripping undergrowth would ensure we’d be soaked within the hour. At our first stop Terry gave us King Billy pine splitting lessons. Using an adze-like device, with its sharpened edge perpendicular to the handle, he showed how a length of downed pine could be split into palings. We each had a go, surprised at the workability of this beautiful honey-coloured timber. 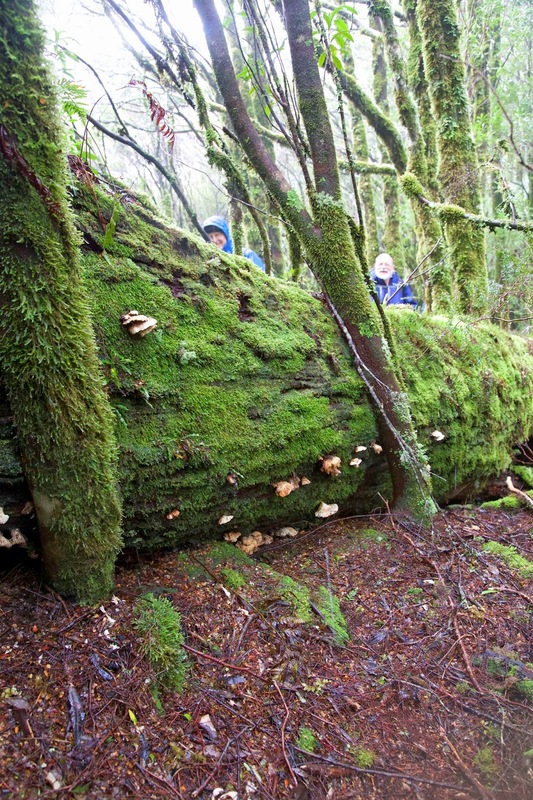 We then continued up through the wet forest to a small clearing, our high point for the day, before continuing across the slope. Soon we were in thick and luxuriant rainforest again, everything a shade of green or hazel. We were walking in misty cloud, but had the feeling that empty space was off to our left. Then there was a lift, and we found ourselves staring down the steep and slippery decline that would take us to the Curtin-Davis mine. An 1895 report on the mine doesn’t exaggerate when it says “the approach to Curtin's tunnel is extremely precipitous”. The writer went on to report "good surface shows" of iron and copper ores, ‘though he was possibly more enthusiastic about the potential for mine operations to harness the copious water of the area. At the time of my visit to the mine a large body of water was leaping over this magnificent mountain gorge. The whole of the area … is covered densely with myrtle, sassafras and leatherwood trees. We stared out over that very scene, and had equal admiration, if dissimilar ambitions for its future. Then, having descended, we had to climb a little, with the aid of some fixed rope-lines, to reach the entrance to the old mine. There we donned head torches and carefully picked our way into the horizontal mine shaft. Terry took care to warn us about the large gaps in the floor, and once we were on solid ground, we stopped and looked around. There were two surprises: first the flashes of colour on the mine walls (what looked to me like copper oxide); and then the invertebrate that had made the shaft a comfortable home. The latter was a very large Tasmanian cave spider (Hickmania troglodytes), complete with its sizeable egg sac, hanging like a frozen tear drop from a thread of silk. This remarkable spider can live nearly as long as we humans can. And its nearest relatives are in Chile, meaning its ancestors date back to Gondwana. That makes it ancient in more than one sense. I’d seen one of these spiders before in a cave, but had not expected to see one in a mine. I had to chuckle that even in this human-made environment, I was focussing more on wildlife than engineering achievements. I’d done the same once in Parliament House in Canberra, giving most of my attention to the Bogong moths that were flying around the chamber’s enormous lights, rather than the political pomp. At the base of the slope the North-East Dundas Tramway once ran. It took ore from this and other mines back to the town of Dundas. It remains a remarkable engineering feat, given the steep and sodden nature of this place. Even though the line and most of the bridges are no longer extant, the former tramway provided a wide and level means of reaching Montezuma Falls. Given the amount of rain that had fallen, we were keen to see this apparently spectacular waterfall. We weren’t disappointed. 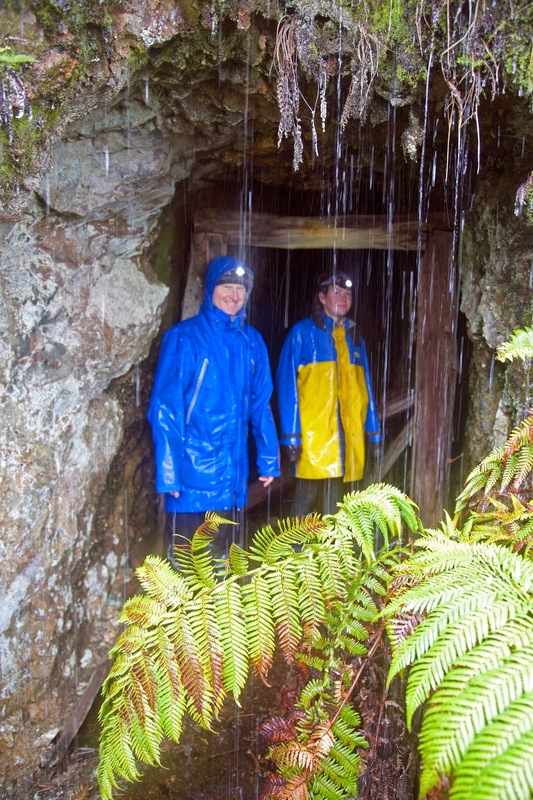 A prodigous amount of water was pouring over the 110m drop, enough to make us glad of our head-to-toe waterproofs as we gawped from the viewing deck. 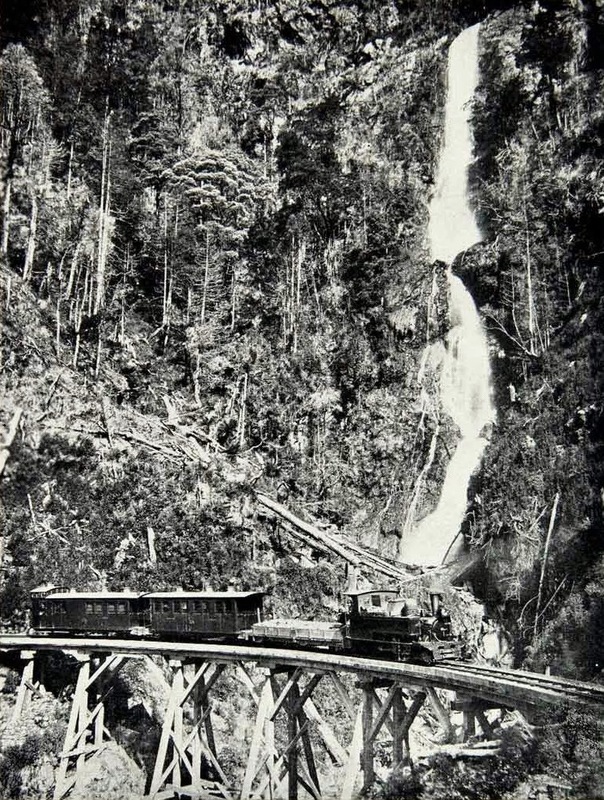 This little railway is a “show” line of the highest order, for it dives quickly amongst the mountains, brushing the fringe of the forests, and at one point giving a near view of the handsome Montezuma Falls – so near that the spray actually dashes at times against the carriage windows. Today walkers, mountain bikers and a few experienced 4WD users still use the track. Where the bridges have gone the challenge for 4WD and MTB users is considerable. We stopped to watch as a couple of vehicles tried to cross one creek. By the time we left the score was Creek 1, 4WDs 1. One vehicle had decided – after two attempts – to give up on the crossing. Our own (new) challenge was to leave this easy, broad track and take to the steep slopes that would lead to our next destination: Fraser Falls. We soon found out why it’s a seldom-visited waterfall. First we had a long, uphill, off-track steeplechase, just to get near to the falls. Then we had a slippery, muddy, nasty descent to get somewhere near to seeing the noisy-but-hidden falls. With much grumping, slipping and sliding, we eventually reached a point where the falls could be seen. 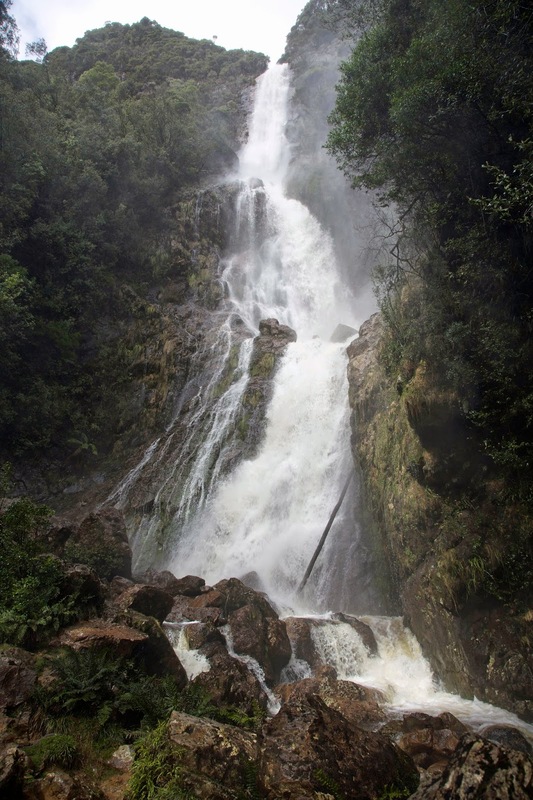 Smaller than Montezuma, but still high, impressive and very full, the falls were surrounded by thick, wet forest. Once we’d got near, a couple of us had to find “the” photographic view of the falls that would make the trip worthwhile. Naturally that involved some more scrambling, and negotiating slimy rocks above a swiftly-flowing stream. By the time we got there we were exhausted. But we took our photos, then slowly gasped and grunted our way back to the descent point. 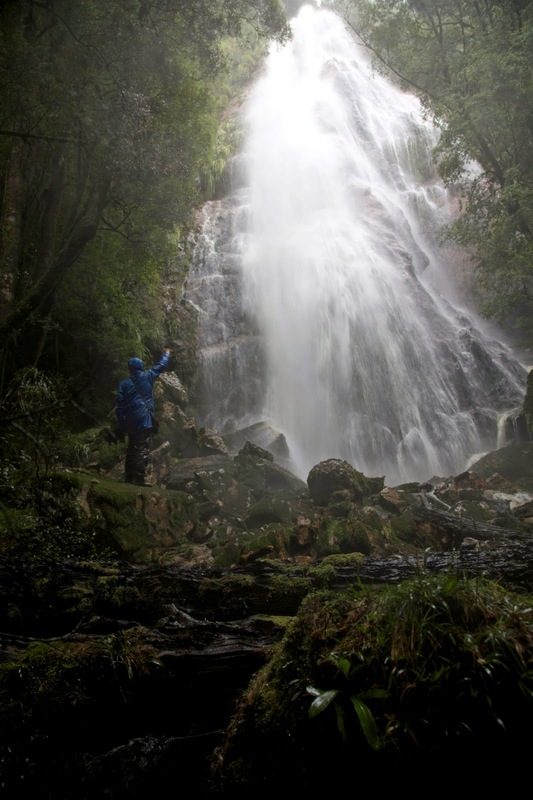 It would be great to say that Fraser Falls, being on Fraser Creek, was within cooee of the hut. It wasn’t. So it wasn’t “soon” that we finally pushed open the door to the hut. But I can end by saying that we did sleep very soundly that night, whatever the decibel rating of the snorers.